First posted at Digitally Downloaded. Cosmic Star Heroine was on my radar since the initial Kickstarter in 2013, but it was not until the Switch port that I was given a chance to experience the galactic wonder for myself. 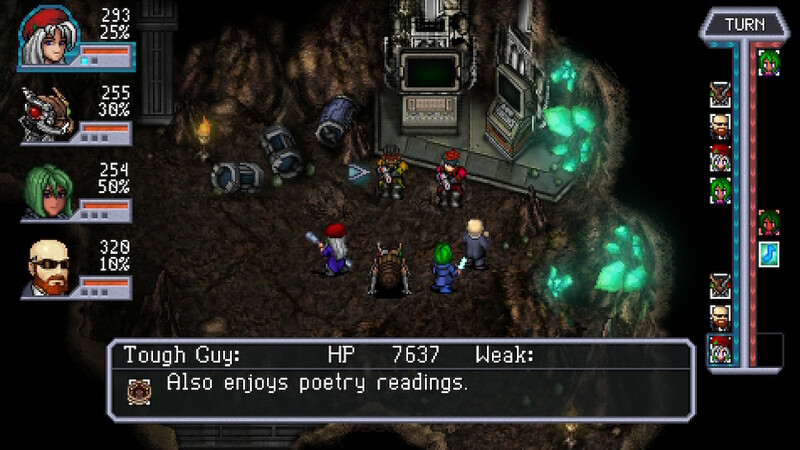 Cosmic Star Heroine is touted as a game for fans of JRPGs of old – such as Chrono Trigger, Phantasy Star and Final Fantasy VI. It is clear that the developer, Zeboyd Games, took its classical inspiration by many titles in the JRPG genre and has crafted a fantastic current day version of a 16-bit role playing game. The story focuses on the character, Alyssa L’Salle, who works for the Agency for Peace and Intelligence. This is a secret organisation that at least on a superficial level claims to work towards a better future for its citizens. Alyssa is a top agent in the agency, and as such is privy to information that leads her to a startling discovery – all amongst the agency is not as it seems. The character if Alyssa L’Salle herself is one that is well presented. Moments after you meet her she is already taking on feats that you would be mistaken for thinking were later game missions. One of the first things that Alyssa does is successfully defuse a bomb in a cool and collected manner. She’s competent, self-efficient and doesn’t need to rely on anybody else for help. It’s a breath of fresh air to see a female character presented in this manner. The side characters are fantastic too. Whilst the game doesn’t dig too deep into any sort of deep backstory, it presents enough to show that the other female characters (Chahn Kaneko, Lauren and Arete) are just as strong and interesting in their own right. The male characters are just as interesting, and their character go beyond the typical ‘buff hero’ fare that tends to be rather common in the genre. There’s also a rather charismatic, philandering robot known as Clarke. All up there are ten supplemental party members to assist Alyssa on her quest (of which you can choose a party of four) that bring humour to the overall story. 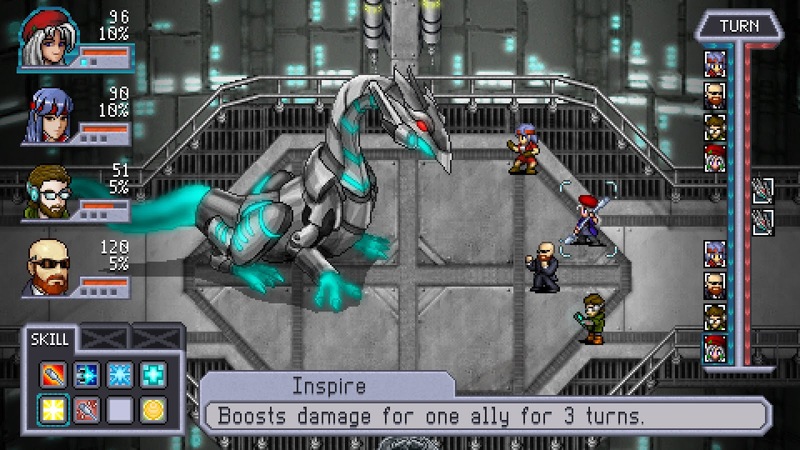 You can clearly see the inspiration from other games when it comes to Cosmic Star Heroine’s gameplay. You can see each enemy on the map before you go in to attack them. The enemies are grouped into three categories – robotic, spectral and organic. These categories each have their own unique resistance and weaknesses. The battles are turn-based and there’s a timer on the side that lets you know when each of your party members or the enemy is due to attack so that you can strategise more efficiently. Each character has a unique set of abilities that they unlock as they level up. These consist of a range of physical attacks, magic attacks, healing abilities, status effects and defence. What makes Cosmic Star Heroine unique is that unless specified each skill can only be used once until you take a turn to defend and recharge them all. This means that you often have to consider what order in which to use your abilities, and when is the right time to spend a turn recharging them. It’s an interesting replacement for a depleting mana point system and it works quite well. There are other abilities that you can gain depending on the weapon, shield or items that you have equipped. There’s also certain accessories that can be used to change the abilities that characters possess. The last important gameplay aspect is the hyper bar which increases every turn. Once maxed out the character will start to glow and enter hyper mode which maximises damage output. It may seem that there are a lot of unique mechanics at play but they co-exist effectively and the game itself never becomes overwhelming. As I mentioned previously, Cosmic Star Heroine takes heavy inspiration from the JRPG’s of the 16-bit era and therefore it makes sense that the graphics follow suit. Not only are they incredibly charming but they vary widely depending on what planet that you are currently exploring. Araenu, the starting planet, is the industrial hub of the galaxy. It’s clear that it is nothing but factories and pollution. So much so that the pollution has led to a never-ending night due to over pollution. Rhomu and Nuluup are planets that consist of a nuclear wasteland with an underground metropolis and an undiscovered jungle teaming with an alien race respectively. Each unique ecosystem comes with its own set of enemies as opposed to a simple colour swap from brown to green. The music is composed by HyperDuck SoundWorks and again works perfectly with the 16-bit bit atmosphere that Cosmic Star Heroine is going for. The soundtrack is brimming with audio that samples saxophones, guitars, synthesised tones and even vocal tracks. The battle music is particularly catchy and one song that I would listen to again and again even without playing the game. Cosmic Star Heroine is a nostalgic experience that is worth playing if you are a fan of the 16-bit JRPG era. The cast is full of wonderful characters, the plot interesting and the battle system engaging. The whole game is wrapped up in a ten-twelve hour experience which was the perfect length to see the story out.